A therapy derived from the eggs of parasitic worms helps to protect against one of chemotherapy's debilitating side effects by significantly downregulating major proinflammatory pathways and reducing inflammation, indicates the first transcriptome-wide profiling of the bladder during ifosfamide-induced hemorrhagic cystitis. The experimental model study findings were published online Feb. 7, 2019, in Scientific Reports. With hemorrhagic cystitis, a condition that can be triggered by anti-cancer therapies like the chemotherapy drug ifosfamide and other oxazaphosphorines, the lining of the bladder becomes inflamed and begins to bleed. Existing treatments on the market carry their own side effects, and the leading therapy does not treat established hemorrhagic cystitis. Around the world, people can become exposed to parasitic Schistosoma eggs through contaminated freshwater. Once inside the body, the parasitic worms mate and produce eggs; these eggs are the trigger for symptoms like inflammation. To keep their human hosts alive, the parasitic worms tamp down excess inflammation by secreting a binding protein with anti-inflammatory properties. 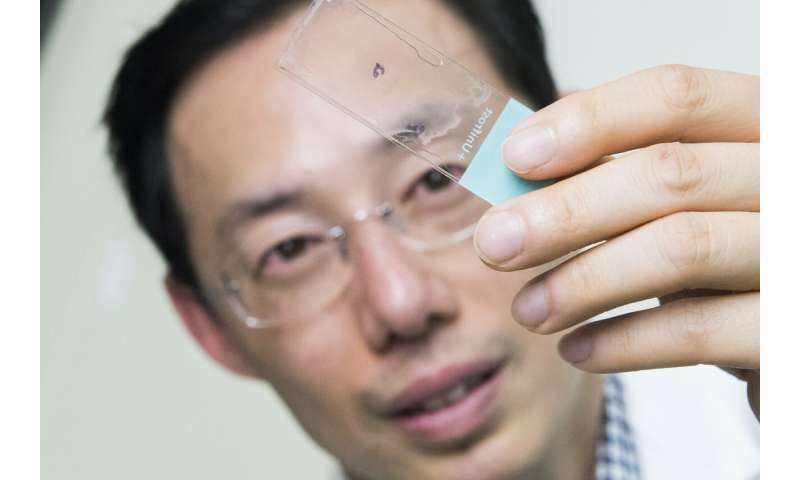 With that biological knowledge in mind, a research team led by Michael H. Hsieh, M.D., Ph.D., tested a single dose of IPSE, an Interleukin-4 inducing, Schistosoma parasite-derived anti-inflammatory molecule and found that it reduced inflammation, bleeding and urothelial sloughing that occurs with ifosfamide-related hemorrhagic cystitis. In this follow-up project, experimental models were treated with ifosfamide to learn more about IPSE's protective powers. The preclinical models were given either saline or IPSE before the ifosfamide challenge. The bladders of the experimental models treated with ifosfamide had classic symptoms, including marked swelling (edema), dysregulated contraction, bleeding and urothelial sloughing. In contrast, experimental models "pre-treated" with IPSE were shielded from urothelial sloughing and inflammation, the study team found. Transcriptional profiling of the experimental models' bladders found the IL-1-B TNFa-IL-6 proinflammatory cascade via NFkB and STAT3 pathways serving as the key driver of inflammation. Pretreatment with IPSE slashed the overexpression of Il-1b, Tnfa and Il6 by 50 percent. IPSE drove significant downregulation of major proinflammatory pathways, including the IL-1-B TNFa-IL-6 pathways, interferon signaling and reduced (but did not eliminate) oxidative stress. "Taken together, we have identified signatures of acute-phase inflammation and oxidative stress in ifosfamide-injured bladder, which are reversed by pretreatment with IPSE," says Dr. Hsieh, a urologist at Children's National Health System and the study's senior author. "These preliminary findings reveal several pathways that could be therapeutically targeted to prevent ifosfamide-induced hemorrhagic cystitis in humans." When certain chemotherapy drugs are metabolized by the body, the toxin acrolein is produced and builds up in urine. 2-mercaptoethane sulfonate Na (MESNA) binds to acrolein to prevent urotoxicity. By contrast, IPSE targets inflammation at the source, reversing inflammatory changes that damage the bladder. "Our work demonstrates that there may be therapeutic potential for naturally occurring anti-inflammatory molecules, including pathogen-derived factors, as alternative or complementary therapies for ifosfamide-induced hemorrhagic cystitis," Dr. Hsieh adds. Doxorubicin alone or with ifosfamide for treating soft tissue sarcoma?